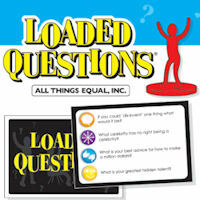 Loaded Questions is a best-selling party board game that tests players on how well they know each other. The game tests your knowledge of other people's opinions as you race your opponents around the board. By correctly guessing your opponent's answers to probing, opinion-oriented questions, you advance around the board. The rules for Loaded Questions are pretty simple: Players move their game pieces around the board based on the roll of a dice, the read a question corresponding to the color of the space they land on – orange for hypothetical questions, purple for "anything goes", blue for "no brainers", and yellow for personal questions. Every other player writes their answer on a piece of paper; the player who asks the question must then try to match up the other players with their answers. Each correct match lets the player move forward one space. Reach the end first to win Loaded Questions! The questions are designed to spark laughter, creative discussion and lasting memories. Whether you're with friends, family or people you're just getting to know, Loaded Questions is the perfect answer to "what should we do now?" Expose your true personality with Loaded Questions! Players answer questions from four categories - Hypotheticals, Anything Goes, No-Brainers, and Personals. A player asks a question from one of these categories, and the other players write down their answers. The player then collects the answers and must guess whose answers are whose. Each correct match allows the player to advance. Reach the end first to win Loaded Questions! How often do you get to laugh with politics? In this latest edition of the best-selling line of Loaded Questions games, it's not a matter of how much you know about politics, but how well you know your fellow players! However serious or silly your answers, they are never right or wrong. If only politics were this fun!